Getting your home renovated can truly transform your daily living space. It can breathe new life into your home, significantly increasing its value. You can enjoy a great deal of satisfaction when you successfully complete a remodelling project. Whether you replace your countertops or you bring down an interior wall to free up some space, there’s some sense of pride in accomplishing something new for your home. One of your major concerns when discarding renovation waste is the cost and another would be the logistics. Depending on the size of your renovation project, rubbish removal can be quite costly. Also, you would have to plan where you should store all the waste items and materials while your project is ongoing. If you plan on dumping your own waste to a sorting facility or a rubbish tip, you should know that doing so would be time-consuming and impractical. If you do not have the appropriate vehicle to accommodate your waste, you would have to hire a van or a trailer. This scenario would be likely if you plan to replace your old bath or you’re remodelling a big living space. You might be thinking of hiring a man-with-a-van to collect and dispose of your home renovation rubbish. It is true that you can focus more on your other tasks because someone else will take care of the waste for you. However, this option is not cost-effective. If the van cannot accommodate the size of your rubbish, then several trips would be necessary. This means that you could be looking at significant waste disposal expenses. On the other hand, the cost-effective, convenient and practical way to discard rubbish from home renovations is to hire a skip bin. Here at A’n’K Budget Bins, we will help you decide what size of skip bin would be most suitable for the size of your home renovation waste. Schedule a delivery and we will dispatch our team with the skip bin on the agreed date. While your home renovation project is running, you can keep the waste inside our weather-proof bins. In this way, you can focus your energy and time on other tasks and not think about the rubbish. Once the bins are filled, our team will pick them up. We will bring the waste to a licensed sorting facility where the rubbish will be salvaged and sorted for redistribution or reuse. Here at A’n’K Budget Bins, we always assure our clients that they are getting the best value for their money when they book our bins. However, there are still some ways they can use to ensure that the skip bins are utilised efficiently. Before you decide to book a bin, you have to gain a foresight of the types of waste materials your renovation project will produce. Write down a list of items or materials that will be considered as waste, including rubble, insulation, bricks, old cabinets and discarded fixtures, among others. Doing so will help both of us evaluate your specific skip bin requirements. However, it is also important to note that there are items that cannot be placed in the bins. Since we comply with environmental requirements, we do not accept hazardous items such as used or unused oil, car tyres, tree stumps, paint tins, asbestos and Fibro cement sheeting. We only allow spring mattresses by special arrangement. One of the best ways you can maximise your skip bin rental is by getting the right size. You would not want to hire something that is too small or too big for the amount of waste you’d have. Take a look at the details below so that you can get an overview of the skip bin sizes. 2m3 to 3m3 – These bins are equivalent to two to three trailer loads and they are ideal if you’re planning to renovate a single room. They may be considered as mini skip bins but they can still provide enough waste disposal storage. 4m3 to 6m3 – These bins have the same load capacity as four to six trailer loads. They are ideal if you’re planning to renovate multiple rooms in your house. 8m3 to 12m3 – These bins can carry the same load as eight to twelve trailers. They are usually used for projects that involve multiple floors of a building. To make the waste removal process more convenient, it is advisable for you to gather your rubbish close to where you plan to position the bin. This will help you and our team load the waste into the bin with ease. Collecting your waste in a pile also makes it easier for you to properly estimate the amount of rubbish you need to get rid of and the ideal skip bin size for it. When selecting the location for your skip bin, remember that it has to be easily accessible from the road. Some people prefer to place their bins on a footpath or on the road. However, we advise against this since doing so will attract your neighbours to place their own waste in your bin. Also, such arrangement will require you to obtain a council permit. When you hire a skip bin from A’n’K Budget Bins, you will see the waste level marks. Remember to tightly pack the waste and keep the waste within the markers. 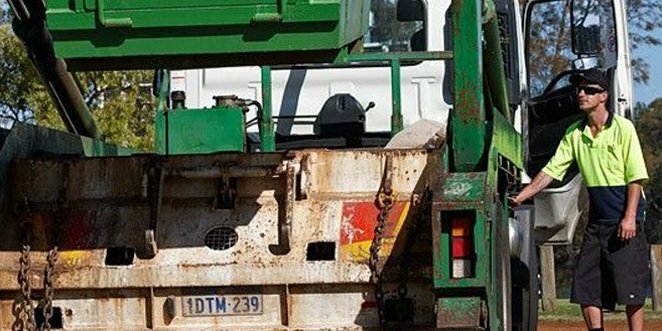 If you fill the bin above the allowable waste level, we won’t be able to accept your entire skip load and the excess waste will be left with you. To determine the right skip bin for your renovation waste, feel free to give A’n’K Budget Bins a call. Our friendly staff will be more than happy to assist you.